"We need anime that's more free spirited and fun, instead. Why did it have to become a fighting anime?" I can't believe it's over! To be honest, with the amount of mayhem that was going on in the last disc, there was no way in the world that I could see them wrapping this series up in only one more disc, without some lame abrupt ending. Fortunately, I was wrong. The climactic build-up continues with steady pacing until the ultimate showdown and final revelations. Perhaps the very end is a little too neatly resolved, but the action never ceases through the five final episodes on this last installment of Martian Successor Nadesico. Wow, this has been quite the ride, and I know it's one I'll look forward to visiting again. Let's Geki In! As the disc opens, a young Jovian girl is recovered from space, suffering from amnesia, or so it seems. We of course remember that she is actually Yukina Shiratori, whose mission it is to seek out Haruka Minato (Maya Okamoto) the woman who her brother Tsukomo has fallen in love with. When the UEAF discovers she is aboard Nadesico, they are ordered to keep her under protection, but is she really being kept as a guest or being used as a pawn to lure in the bigger game? The repercussions will spread the crew of the Nadesico like seeds in the wind, as plans hatch to replace our veteran Jovian fighters with new, and more malleable personal. I'm hesitant to give any more away as I don't want to spoil anything, but if the battles were big before, you haven't seen anything yet! Oh yeah, and they tie up some loose ends pretty well, too. As this is the last installment in the series, I think it is prudent to cover some of the reasons why I have been enjoying it so much. To start with, the large cast has allowed a lot of room to develop tangents to the overall plot. While character development hasn't really been a huge focus, there has been enough exposition to get to know everyone, if not on a really intimate level, but by focusing on the quirks of each character things have been kept pretty light... and unpredictable. There is a good deal of action, yet it has not been the main attraction. There have been a number of good surprises, several relationships to keep track of, and lots of goofy interjections by several members of the crew. The animation is a little older looking, but it is still very cool. The main story is complex enough to hold one's interest, without becoming extremely technical in nature or requiring a good memory of details to enjoy. The ongoing theme of anime fandom also really piqued my interest, it was extremely well integrated into the series. Not too serious, not too deep, just an awful lot of fun with a cast full of strange personalities, big robots and cute anime girls. Martian Successor Nadesico gets the thumbs up from this space cowboy! Image Transfer Review: Video quality is consistent with the rest of the series, with a bit of grain here and there, a few aliasing and compression issues, but overall a presentation that seems pretty well delivered. Audio Transfer Review: As with the rest of the series, Japanese and English stereo tracks are available. The soundstage is well utilized, for foley and music effects, with dialogue being fairly center focused. No audio anomalies were noted. Extras Review: Front end trailers for other ADV titles are the only extras, accessable when loading the disc. Farscape, AD Police, Reboot, Orphen, Gasaraki, and Spriggan are included. These can be skipped through with the chapter skip button, or bypassed completely with the menu button. 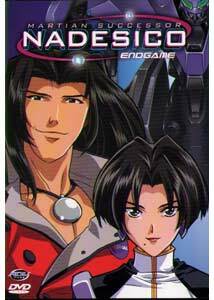 "And now, the end is near, and so I face the final curtain, for anime, I recommend, Nadesico, this one's for certain." Ahem. Well, here we are after a long trek across the galaxy and back, as Martian Successor Nadesico comes to a close. Akito, Yurika, Ruri and friends have taken us a memorable journey, wrapped up with a pretty decent finale, and one I wasn't expecting, but whase is new for this series? "We'll have fun, fun, fun 'til our daddy takes our spaceship away..."